TV adaptation of Neil Gaiman's cult novel. "It's about getting people to believe in you," Mr. Wednesday explains to ex-con Shadow Moon, while explaining the basis of a scam. That phrase might also encapsulate the gist of American Gods, Neil Gaiman’s 2001 cult novel, which has hit TV screens courtesy of Bryan Fuller, probably TV’s premier exponent of the visual arts. I can’t imagine the adaptation being entrusted into more sympathetic hands. A heady mix of myth, sociology, and hazy theology, with a large dollop of Fuller’s jet-black humour, plus violence, graphic sexuality, gore and death - American Gods is a giddy head-trip through humanity's relationship with religion, dogma and the telling of stories. It starts with what might be a chance meeting. Shadow Moon (only a Native-American should be allowed to have that name), played by a taciturn Ricky Whittle, is released early from prison after learning about the death of his beloved wife Laura (Emily Browning) in a car accident, together with his best friend, while both in a distressingly intimate situation. Delayed at the airport, he encounters an oily charmer who arbitrarily calls himself ‘Mr. Wednesday’ (Ian McShane, giving us his best gravelly tones). Mr. Wednesday offers Moon a job - "legal, for the most part" - as his chauffeur and assistant, and with nothing left to lose, Moon accepts, albeit unenthusiastically. We are then taken on a road-trip, where we have a series of encounters with Wednesday’s friends and enemies - it’s sometimes hard to tell the difference. Wednesday is on some kind of mission of recruitment, and it soon becomes apparent that Shadow Moon has inadvertently got himself caught up in a feud that is escalating into a war - although exactly what this war is about, between whom exactly it rages, and to what purpose, remains frustratingly obscure. Mr. Wednesday isn’t one for transparency or truthfulness, despite being an enthusiastic raconteur. What he might ultimately require of Moon, ostensibly his ‘assistant’, bodyguard and driver, remains unclear. Moon finds himself thrown into another world, one founded on myth, fairy-tale and populated by a plethora of arcane or long-forgotten supernatural beings. Readers of the original Gaiman novel will have a better idea of what is going on, but TV viewers will have to wait for several episodes before getting a tenuous grasp on the proceedings. 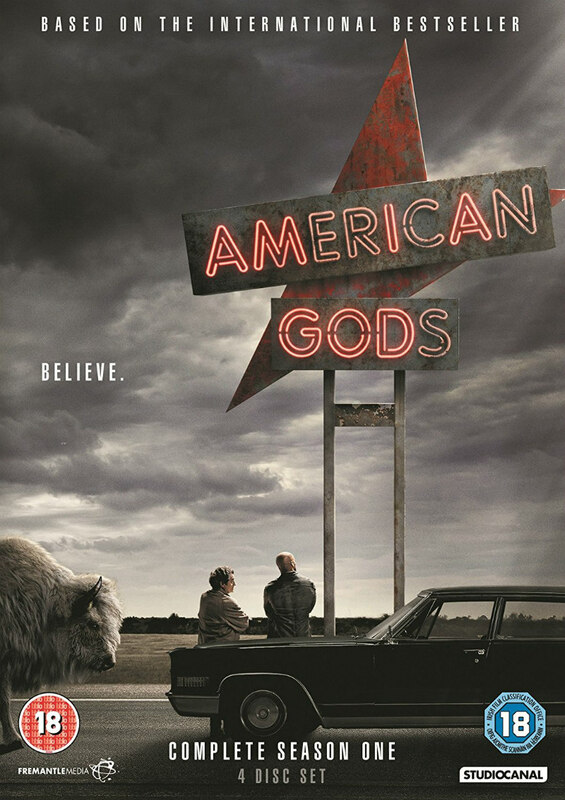 Executive producers Fuller and Michael Green (who worked together on NBC's Heroes) have kept American Gods faithful to the vision of Gaiman's novel, and fans of the book should be pleased with the number of characters the show attempts to introduce in various vignettes, and with how the series portrays them. Highlights for me were Pablo Schreiber’s Mad Sweeney - the tallest and fieriest Leprechaun you’ve ever likely to encounter, who takes over any scene as soon as he enters it. Gillian Anderson is clearly having a whale of a time as Media, as is Peter Stormare as Czernobog, and Crispin Glover is as arresting as ever as the mysterious Mr. World. But the most surprising alteration to the book is how Laura, Shadow Moon's dead wife, (yes, she IS dead) has gone from a supporting player to a major scene-stealer - from a sad, wandering corpse, to a complex character - a faithless but feisty wife, determined to gain redemption from the good man she has wronged. ‘Tech Boy’ (Bruce Langley) too, no longer looks like a lardy, pallid kid who lives on a sofa attached to a games console, but is a ruthless, amoral, teen entrepreneur - a capitalist shark who vapes, wears exorbitantly expensive designer sports gear and spends his time pillaging and liquidating dot coms. However, it is McShane as Mr. Wednesday who keeps what is a wildly strung out story hanging together - just. Playing the role at his most seductively disreputable, McShane occasionally expounds on the bizarre imagery and characters making up this other world, but the show never quite attains enough structure for even the most attentive viewer to entirely get a handle on the surreal proceedings, or to understand the stakes involved. This is somewhat the fault of the source material too - the rules of life and death changed, certainly, but it was never made entirely clear how. We are often as disoriented as the hapless Shadow Moon. What keeps us watching American Gods is the visual opulence - the lush, brutal, gorgeousness of it all. As he proved with Pushing Daisies and Hannibal, Fuller is an expert at charming the eye. Director David Slade and cinematographer Jo Williams draw the viewer in with stunning visual details and high production values - sensuous and striking - from fiery-eyed buffalo and grotesque lynching trees, to long dusty roads and small-towns infused with Americana. But if we tear ourselves from the mesmerising spectacle and consider its thematic ambitions, American Gods proves to be a little too mysterious for its own good. As indicated, this was also a fault of the book, which was hypnotic but nebulous in its narrative intentions. It all felt like it was building to something stupendous, but ultimately, it’s the journey, not the destination, that matters. What does American Gods want to tell us about humans and their divinities? Perhaps more the point is that a storyteller is a kind of ‘god’ creating a world, but also a kind of con-man – as Wednesday indicated, “It's about getting people to believe in you." But, perhaps the most important question that needs to be answered is: What happens if they stop believing? American Gods Season One is available on DVD, blu-ray and digital download July 31st from Studiocanal.